Not all teeth whitening solutions are performed the same. Health Canada does not restrict the sale of teeth whitening products, meaning there is no restriction in the Regulated Health Professions act to prohibit application of these procedures outside of a professional dentistry. This means that there are many options and choices, from off-the-shelf drug store products, to services performed by spas and clinics. Having a teeth whitening performed by your dentist is the best way to ensure the best procedures are applied in the most professional manner. They can also select the appropriate amount and type of product used to properly treat tooth discolouration. To help you get your desired appearance, your dentist may recommend treatments such as bonding or veneer to enhance your smile. Make an appointment at Bennett Dental in Sherwood Park to learn if teeth whitening treatment is right for you. The natural tone of our teeth is not completely white, and it is perfectly fine to have teeth that has a range of light-grey or light-yellow overtones. That said, for a number of reasons, it can be desirable to have a whiter or very-white teeth. As we age, our teeth naturally darken, but the colour of our teeth can be affected by surface stains from tobacco use, certain foods and beverages. One way to safely change your appearance of your smile is through teeth whitening. Would you like your teeth to be brighter, whitened and clean? The combination of professional application and products can make the process among the safest of cosmetic dental procedures. If you are considering professional teeth whitening, Sherwood Park has Bennett Dental clinic who can provide this service in the most hygienic and comfortable manner. Under the consultation of your dentist, the cause of your tooth discolouration can be determined, and a treatment recommended. Unlike store bought products, dentists have access and the training to apply specific bleaching treatments. 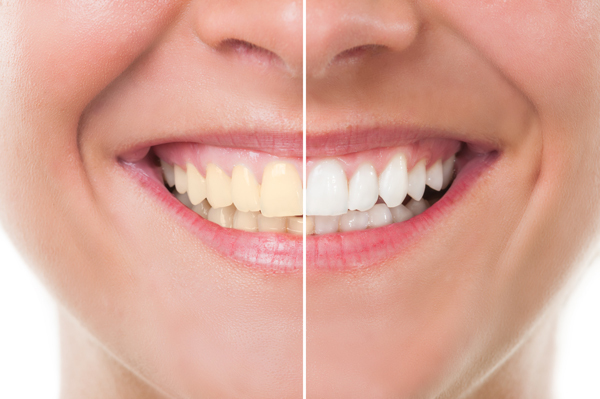 Living teeth can undergo vital bleaching treatment which helps remove the visual stains from food, tobacco, of through the natural aging process. For teeth no longer alive, such as the teeth that have undergone a root canal , non-vital bleaching can lighten tooth from the centre outward. Make sure you discuss with your dentist whether this procedure is ideal or recommended for you. Certain situations may prevent us from performing the service such as gum disease, open cavities, braces (or recent removal of braces), or if a patient has recently undergone surgery. We always put your health and safety first.